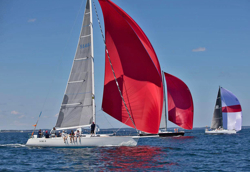 (Marblehead, MA)- Plans are well underway for the biennial Marblehead-to-Halifax ocean race with less than a year to go. The Race will begin on Sunday, July 7, 2019. The committee is working hard to attract another exceptional fleet like the one that set new records a year ago. Anne Coulombe of the Boston Yacht Club in Marblehead and Richard Hinterholler of the Royal Nova Scotia Yacht Squadron will return as Race Directors. Rear Commodore David Bows of the BYC and Michael Simms of the RNSYS will co-chair next year’s event. Steele Auto Group, the prominent Atlantic Canadian company, is the 2019 title sponsor for the Marblehead to Halifax Ocean Race. Steele Auto Group is based in Halifax and owns 29 dealerships in the region. "We're thrilled to be a supporter of such a prestigious sailing event here in Halifax,” stated CEO Rob Steele, a member of the Royal Nova Scotia Yacht Squadron, co-sponsor of the MHOR with the Boston Yacht Club. The 363 nautical mile Marblehead-to-Halifax Ocean Race began in 1905. It has been held every other year, except during war time. It caps a full weekend of Independence Day festivities in Marblehead which includes 4th of July fireworks, the Marblehead Arts Festival and the harbor illumination. The MHOR website is active at http://www.marbleheadtohalifax.com. Or, you can contact the Race Director at email- race@marbleheadtohalifax.com or contact Ed Bell, BYC P.R. Chair at email- edbell40@gmail.com. Add to Flipboard Magazine.